Date: 24th January 2012 at Mullocks Auction House. Mullocks Auction house will be holding another auction relevant to Punjab and Sikhism. The house has for sale numerous important books, letters, drawings and other artefacts related to Sikh and Punjab heritage. Guru Gobind Singh with the Panj Pyare. Solid Silver plaque depicting tenth Sikh Guru c1920. 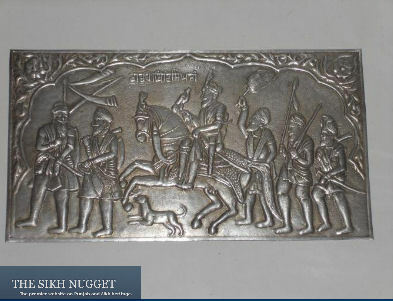 A solid silver plaque of the tenth Sikh Guru On horseback with identifying inscription in Punjabi. The plaque looks remarkably similar to the plaque at Baba Atal in Amritsar, this makes it a very rare piece indeed. A rare cast model of the famous Sikh Cannon Zamzama. 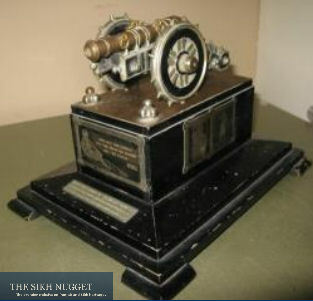 An early 20th Century vintage cast model of the famous Sikh Cannon the Zamzama. Inscription reads – ‘WHO HOLD ZAM-ZAMMAH THAT ‘FIRE BREATHING DRAGON’ HOLD THE PUNJAB’. The base also has images of Sikh soldiers. Length 30cm. Known as the BHANGIAN DI TOPH or the gun belonging to the Bhangi Misl. 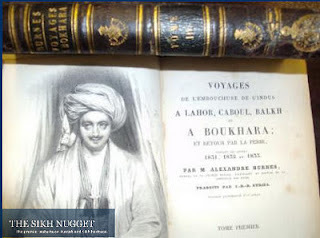 A french translation of the, " Travels into Bokhara; being the account of a journey from India to Cabool, Tartary and Persia; also, Narrative of a voyage on the Indus, from the sea to Lahore, with presents from the king of Great Britain; performed under the orders of the supreme government of India, in the years 1831, 1832, and 1833 (1834)"
* Letters from India – A Journey in the Tibet Lahore and Cashmere. V. Jacquemont - 1835 - published in the lifetime of Ranjit Singh. * Nanak der Stiffer der Sikh-Religion by Ernst Trumpp 1876.A important early study of the Sikh religion by Trumpp this was published a year before the Translation of portions of The Guru Granth Sahib. * Prachin Panth Parkash by Rattan Singh Bhangu. In Punjabi dated 1962 approx 300 pages. 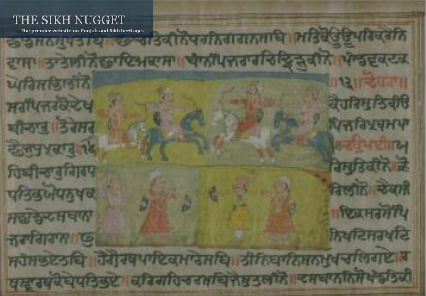 * There is also 3 folios of a Sikh manuscript in Gurmukhi script. This is not titled. They are all framed and glazed. 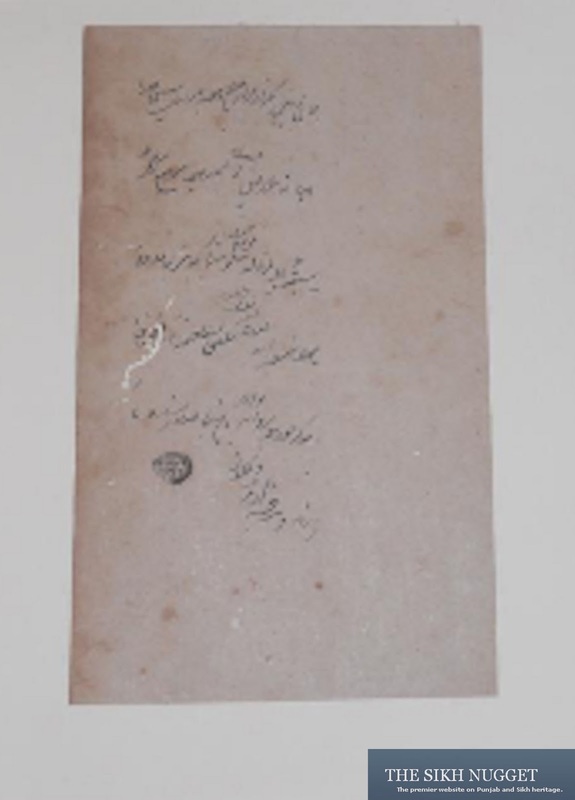 There are letters written by Lord Login regarding Maharaja Duleep Singh some which seem to have been available in previous Mullocks sales. There is also a rare Royal Sikh order of Maharajah Kharack Singh (the eldest son of Maharajah Ranjit Singh) 19th C. Measures 23cm by 14cm (slight worming). 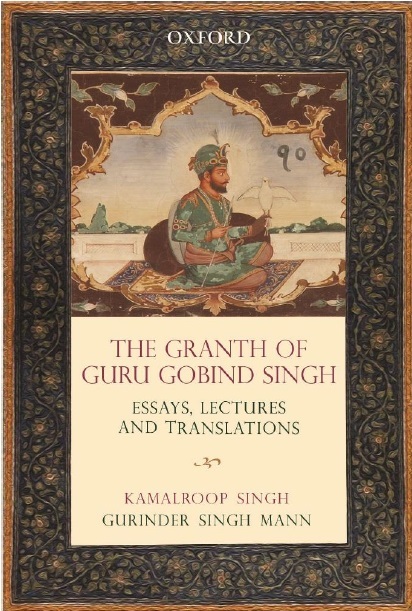 Written in black ink with royal Akal Sahi Seal in Gurmukhi reads – “Akal Sahi Kharack Singh Ji”. The Akal Sahi Seal was a common phrase and used in the royal Sikh court of Lahore. The letter itself is in Farsi. There is a number of paintings and drawings in the lots that are being offered. This also includes a Drawing of Guru Gobind Singh 19th century. A fine drawing of the 10th Sikh Guru. Seated with inscription. c1840-1850. Measures 15cm by 13.5cm. * Watercolour of Maharajah Gulab Singh. * c1920. 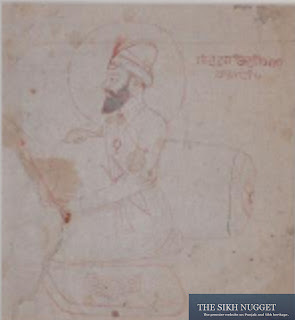 A watercolor of Guru Nanak the founder of the Sikh religion. Measures 20cm by 15cm. * Titled: Panjab – The Maharajah Dhulip Sing. Plate 1 from 'Recollections of India. Part 1. British India and the Punjab' published by Thomas M’Lean London 1847. Superbly hand colored. There are other engravings of Maharaja Duleep Singh as well. * An antique watercolor of a Sikh Guru on Horseback. Measures 27cm x 21cm.It shows Guru Gobind Singh together with his two Akali Singhs. According to Sikh historian, Gurinder Singh Mann,"there are a number of rare items for sale which includes the plaque depicting the Tenth Guru as well as the model of the Lahore Gun, Zamzama. There are a number of important books on the history of the Punjab and the Sikhs which makes this auction interesting." If you are the winning buyer of any of these items contact Sikh Nugget and share your experience with us. 2 folios of a Sikh manuscript in Gurmukhi script. I wonder, what they are worth. Can some one value them for me.